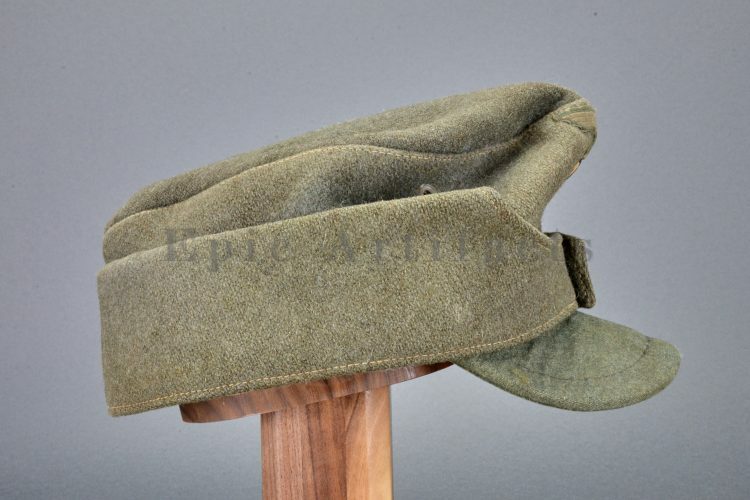 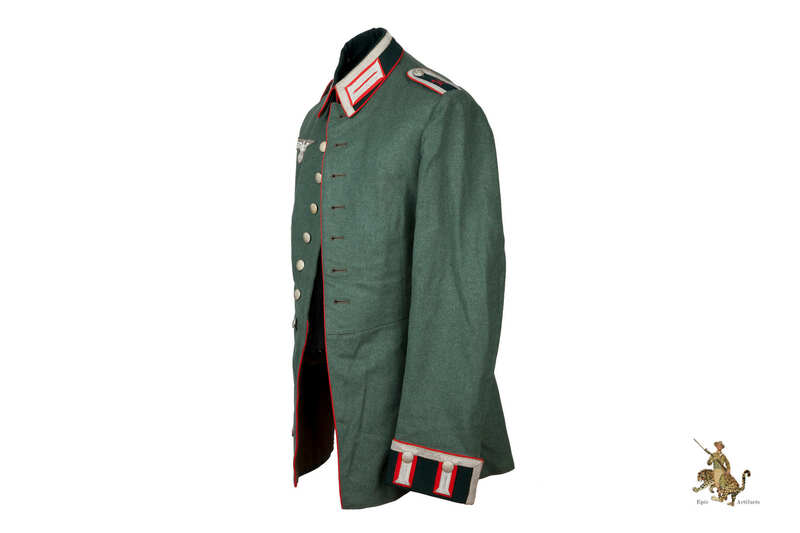 Product Description: A beautiful early Heer NCO Artillery Waffenrock. 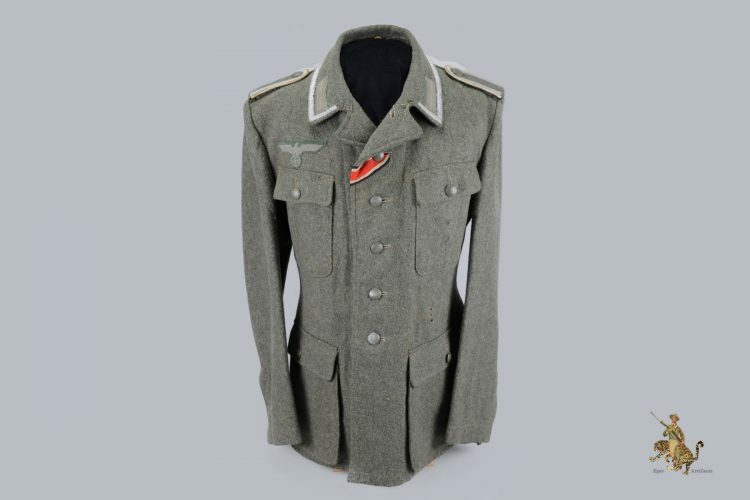 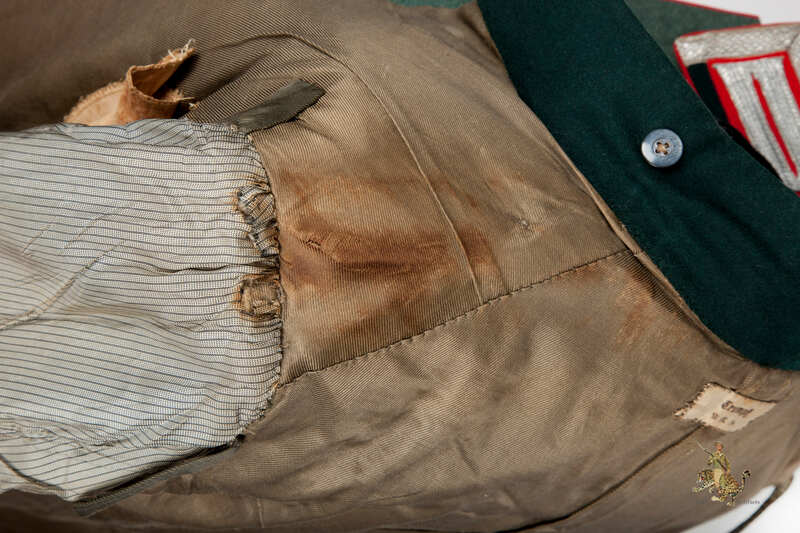 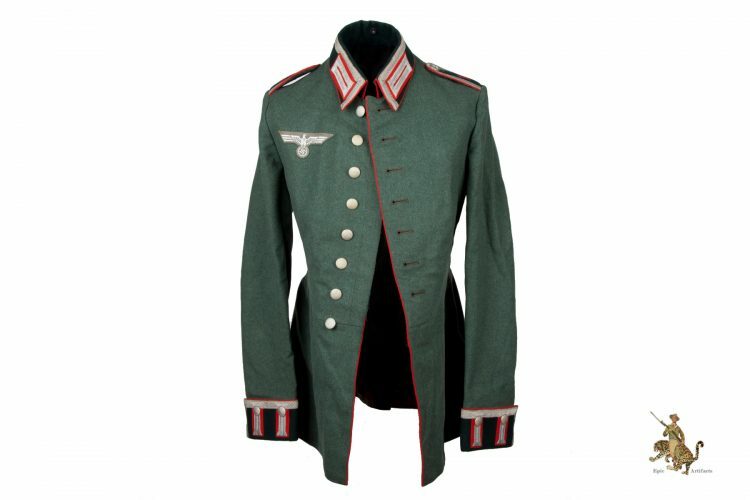 The base material of the uniform is made of a fine feldgrau colored wool. 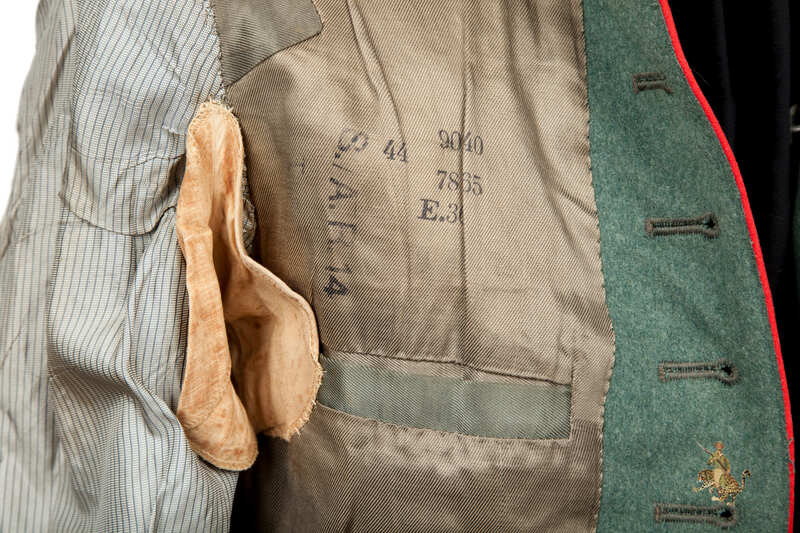 The wool shows no signs of any physical damage by misuse or mothing. 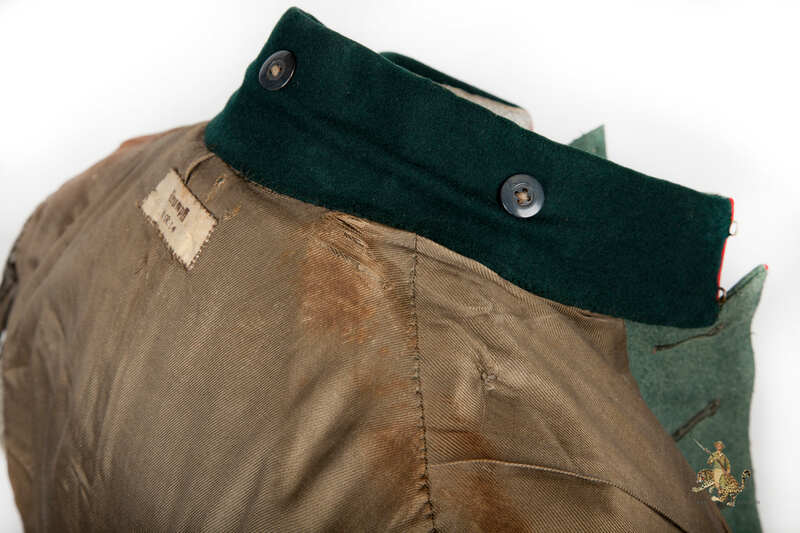 The collar is wrapped in a dark-green wool, and is decorated with insignia. 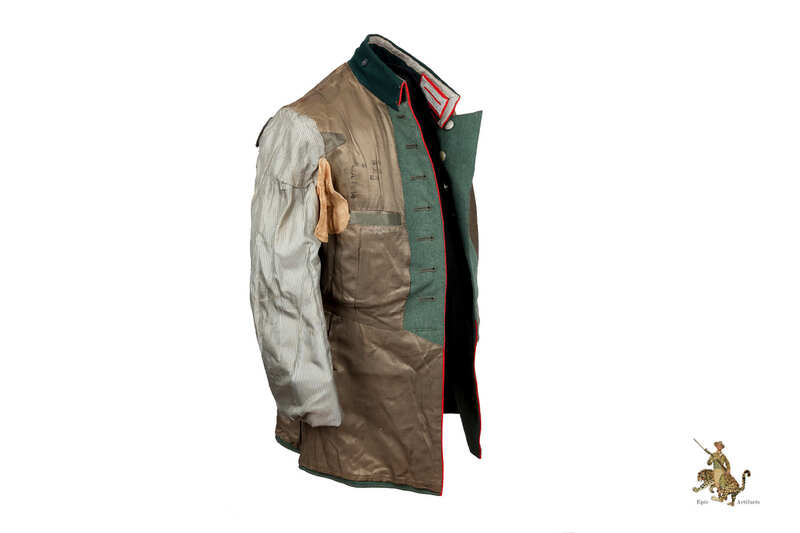 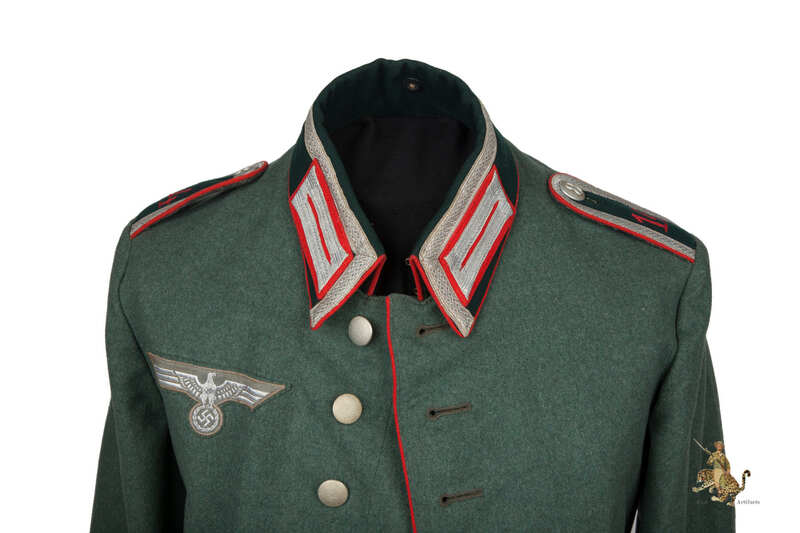 The base material of the two litzen on each side of the collar opening are red, which designates Artillery. 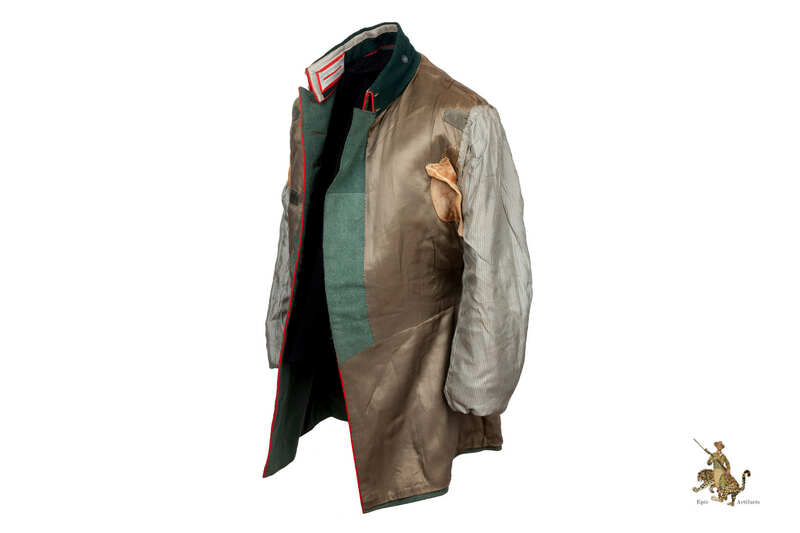 The two litzen themselves are woven from a fine silver flatware thread. 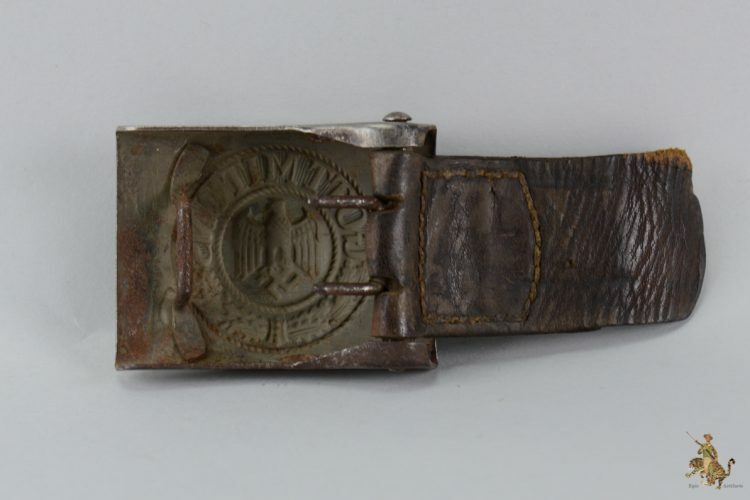 The perimeter of the collar is lined with silver tress, designating that this soldier was an NCO (Non Commissioned Officer). 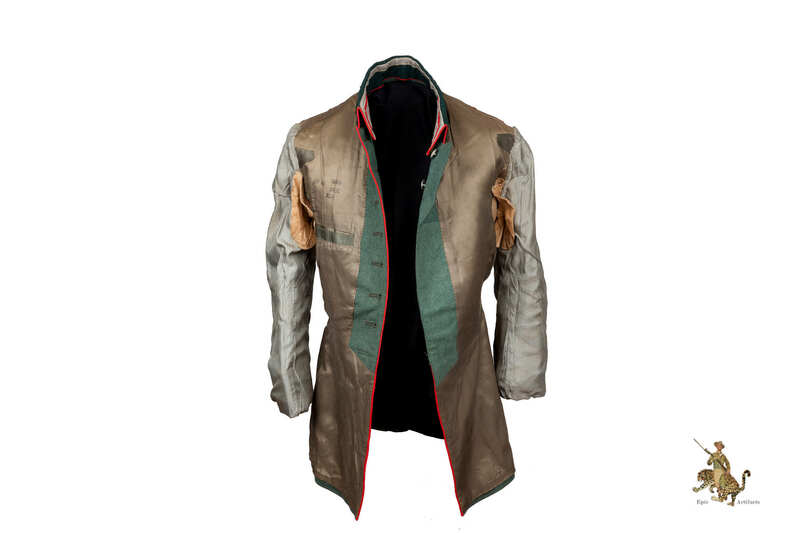 The collar, and its insignia, are without any noticeable damage or mothing. 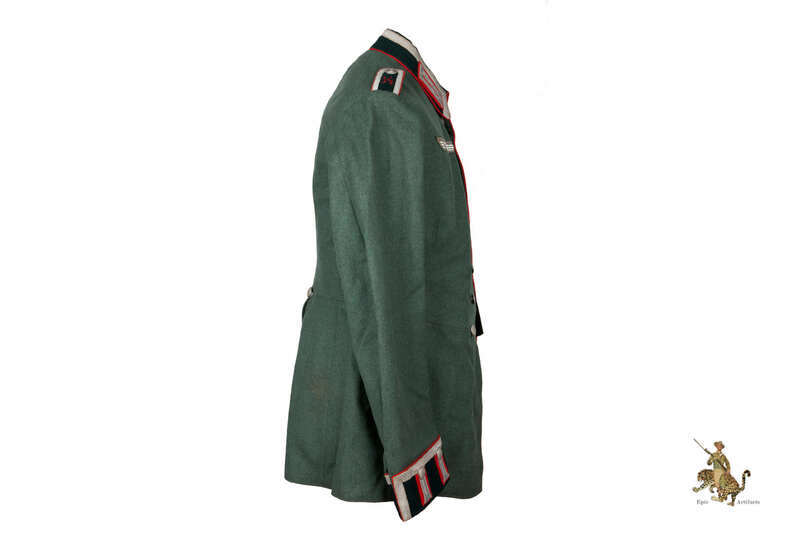 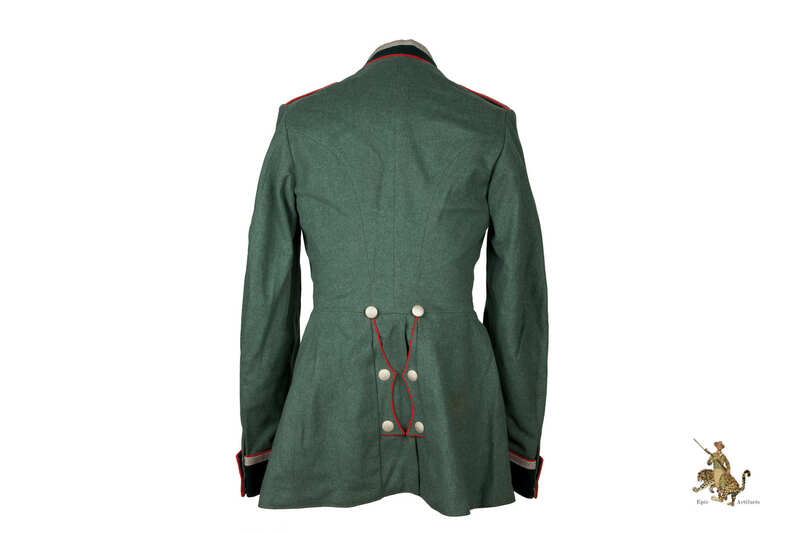 The “sew-in” style shoulder boards of this Waffenrock have a dark green base wool, which is piped in red, and trimmed with a silver tress. 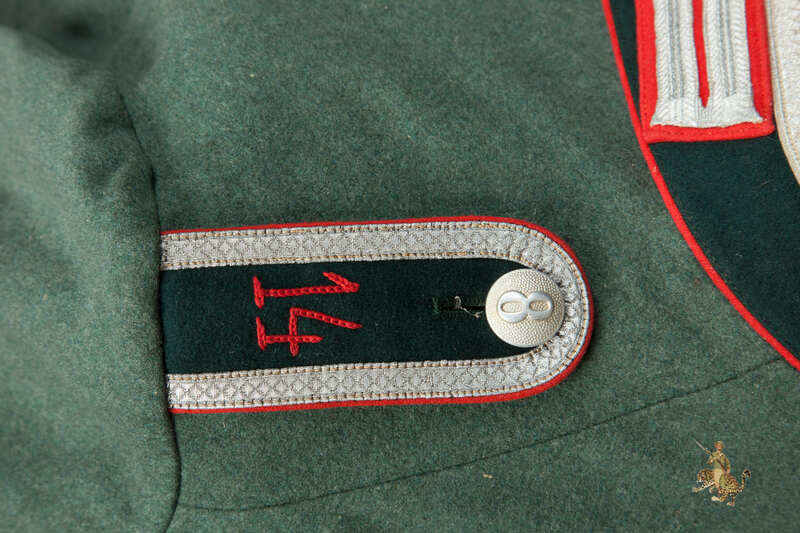 The numbers “14” are neatly chain-stitched on the shoulder boards. 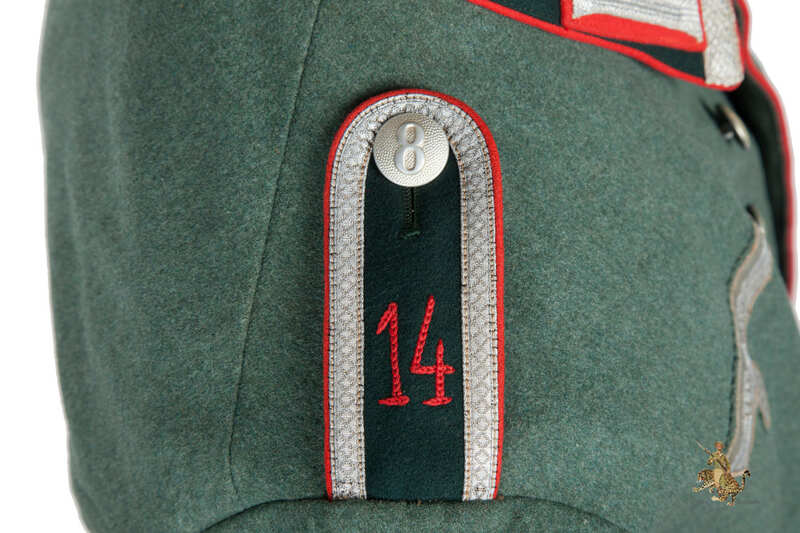 This is the regiment number the soldier was attached to. 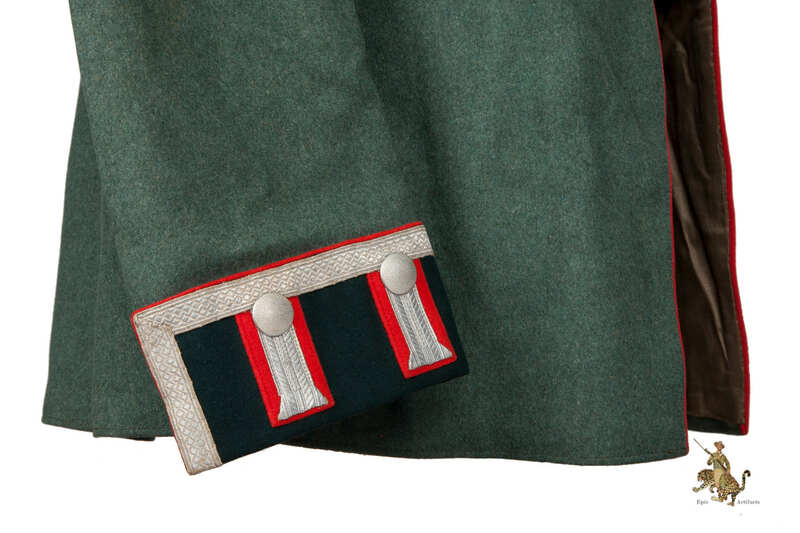 The buttons holding the top portion of the boards to the Artillery Waffenrock are silvered and feature the number “8”, indicating this soldier belonged to Company 8 of Artillery Regiment 14. 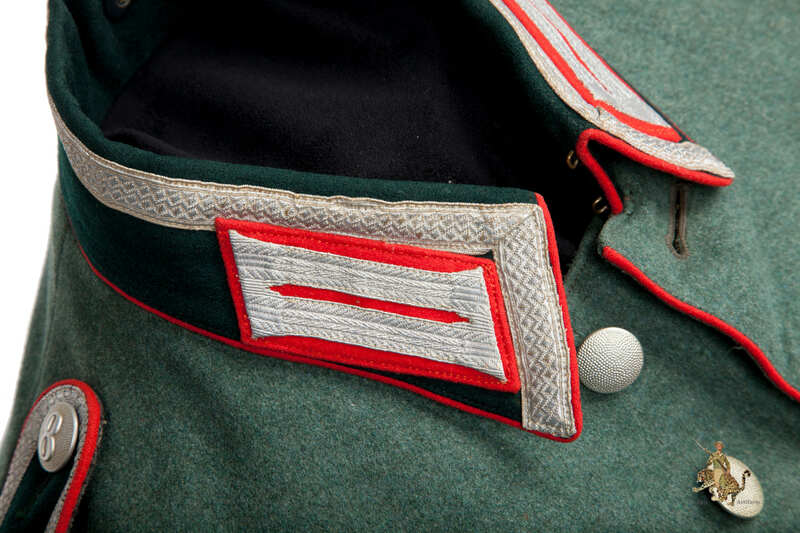 The front breast eagle is an earlier moss-green colored First Pattern executed in silver wire. 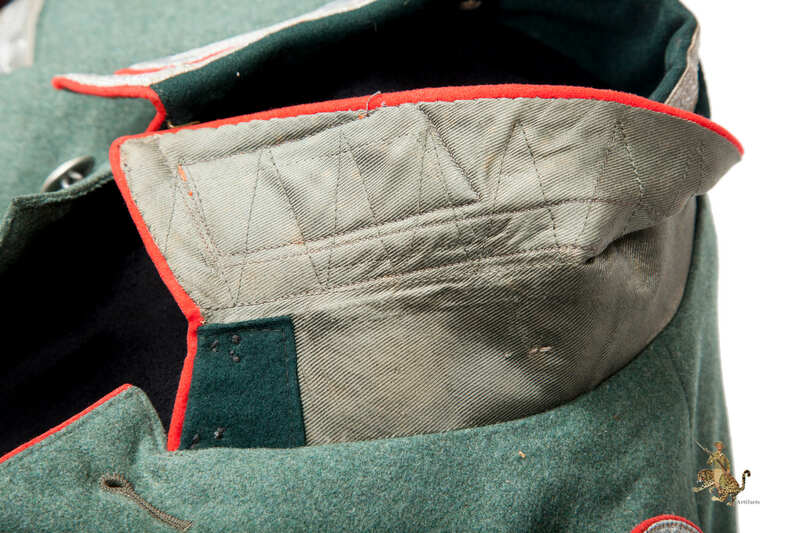 The eagle is without damage and is originally sewn to the tunics breast by very neat hand stitching. 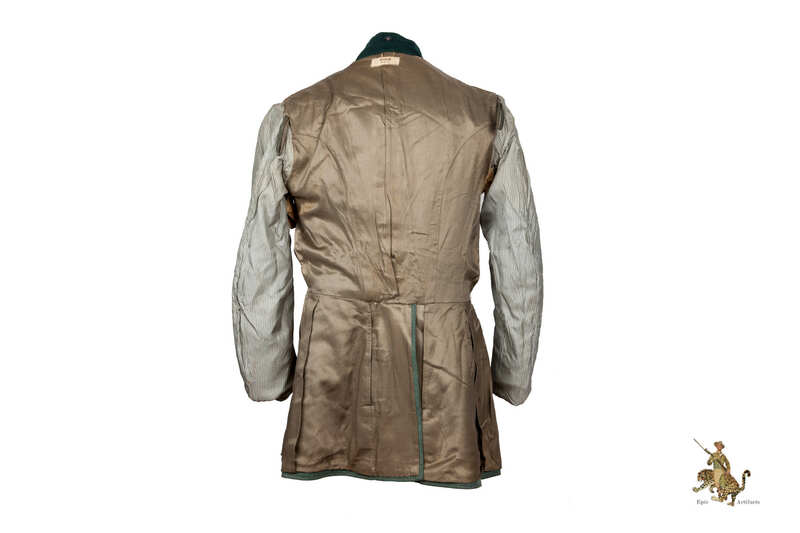 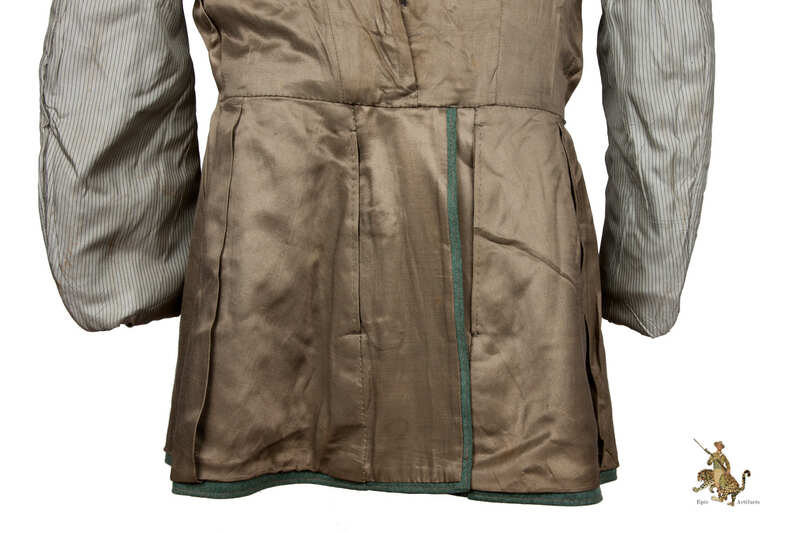 Eight silvered buttons adorn the front of the tunic and all appear to be originally attached. 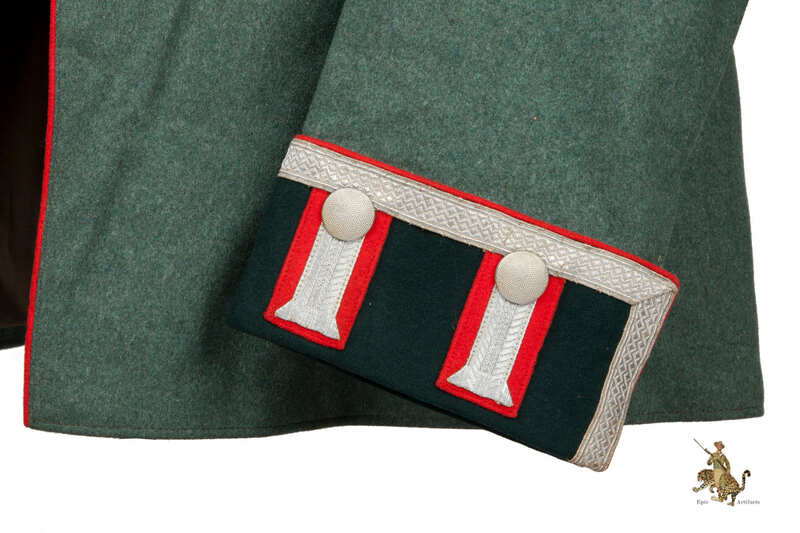 The lower french style cuffs of the sleeves have a dark-green based wool, and is adorned with red piped, silver litzen, and silver tress for NCO. 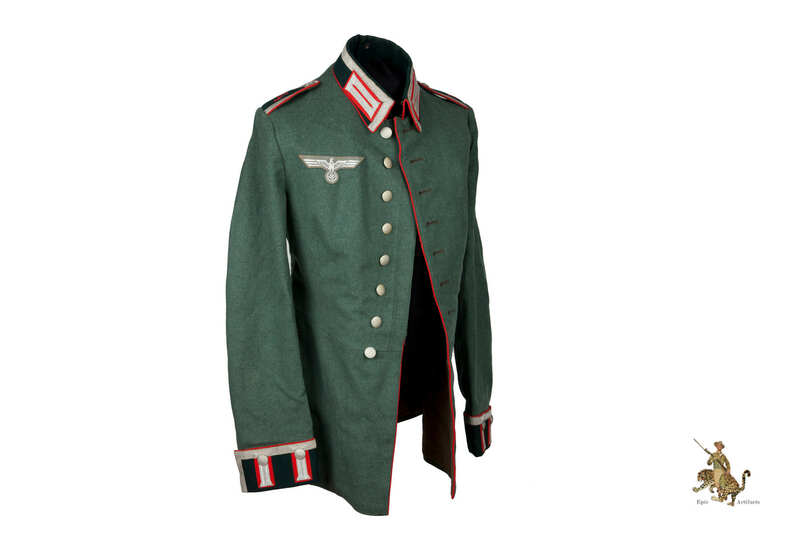 The interior of the Artillery Waffenrock is lined with a fine rayon. 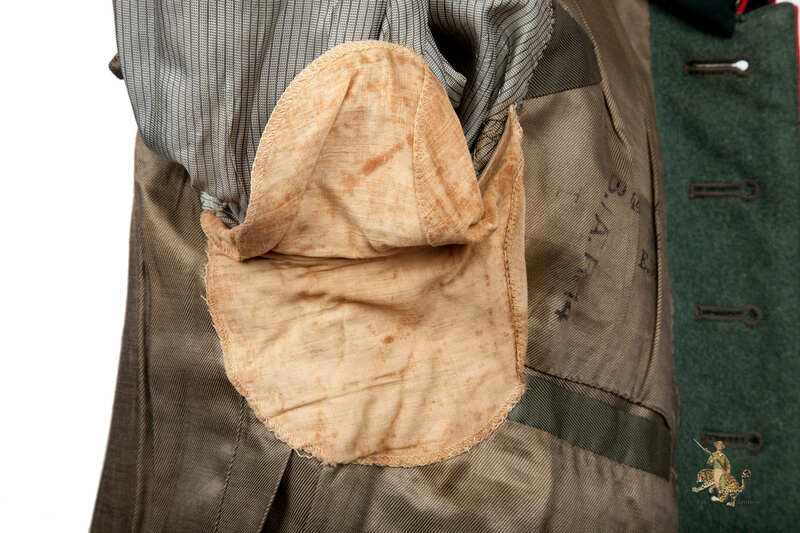 Slight soiling can be observed near the armpit and a few other areas from period wear. 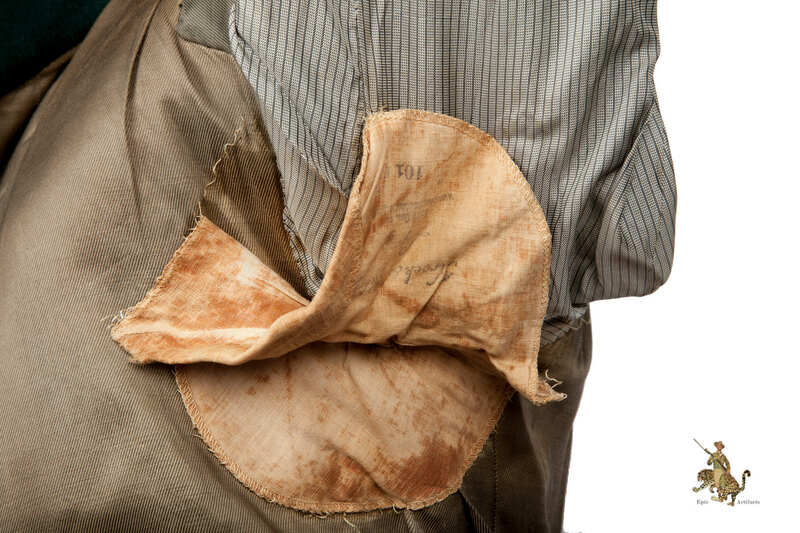 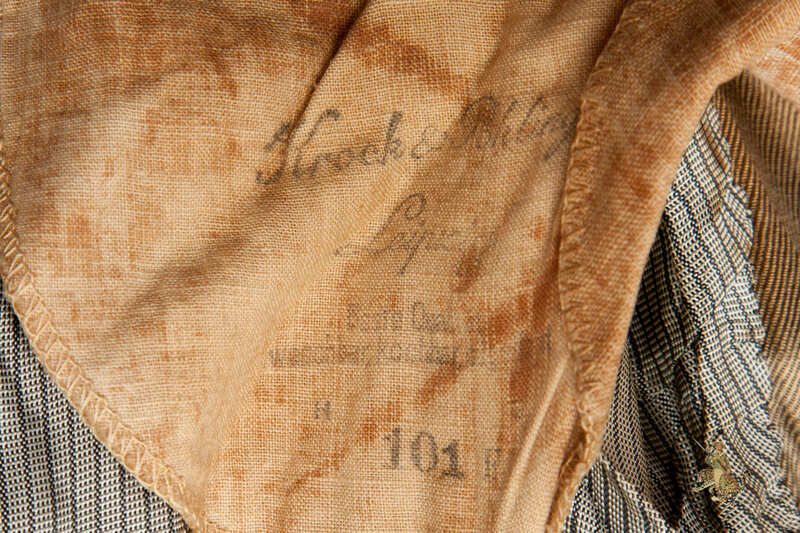 A laundry tag is neatly hand-sewn to the top center of the tunics interior. 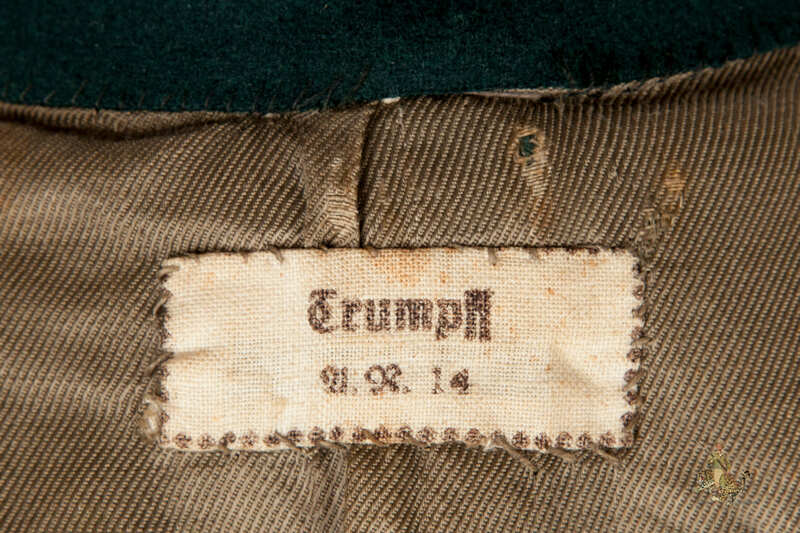 This tag gives us the name of the soldier and his Regiment; “Trumpff, A.R. 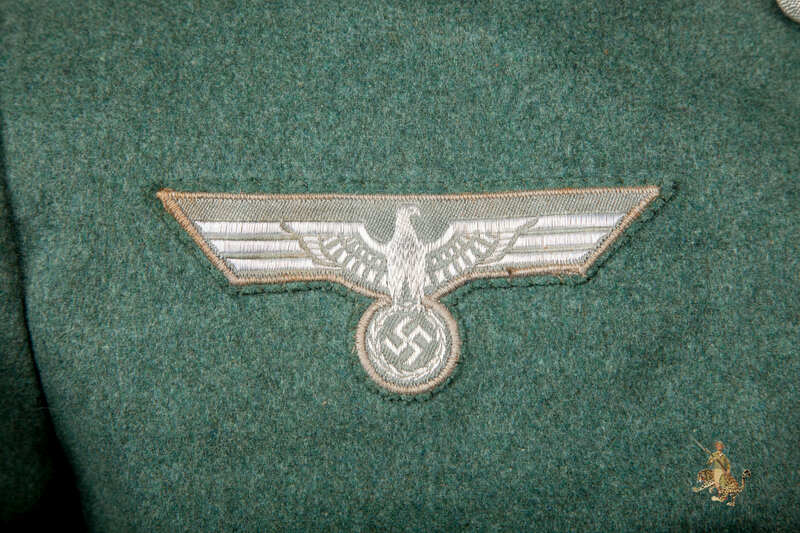 14”. 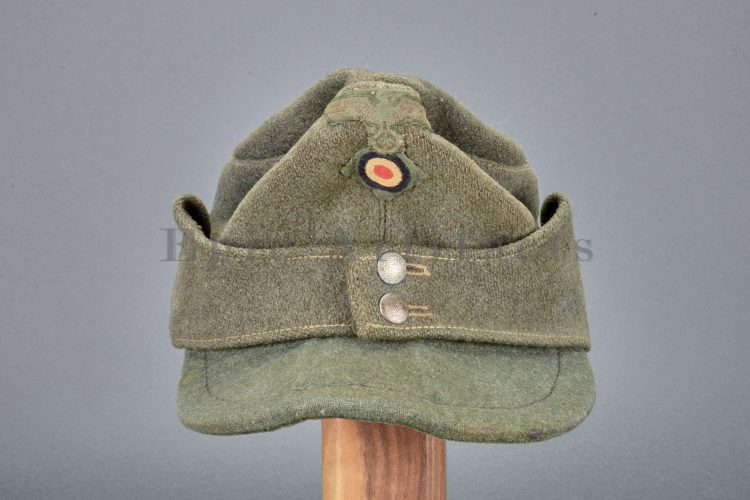 The interior of the Waffenrock is marked with it’s size as well as the unit, “8./A.R. 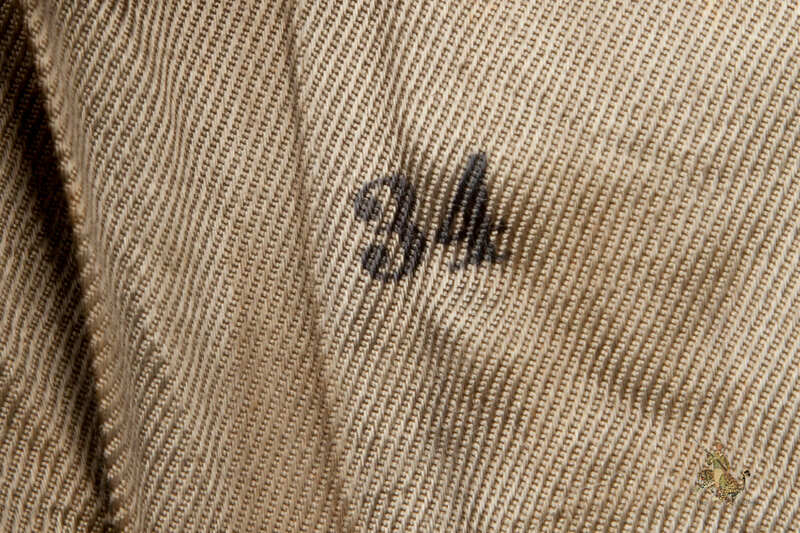 14”. 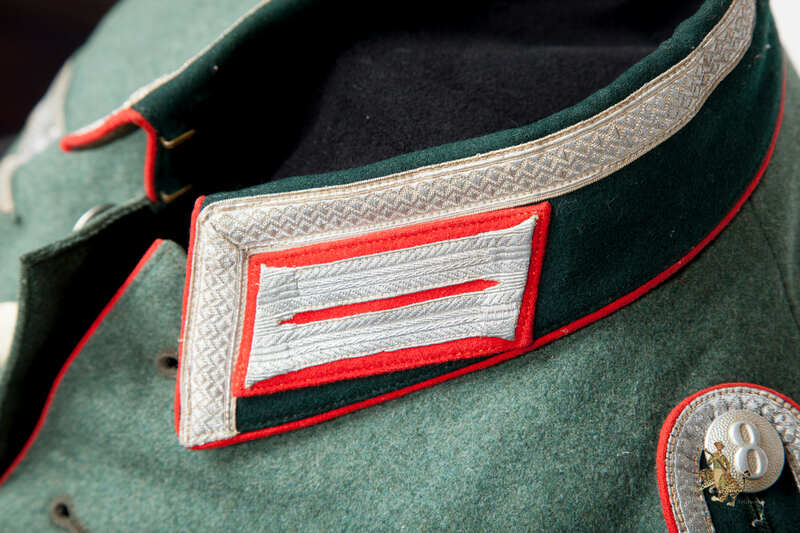 This translates to 8th Company, 14th Artillery Regiment. 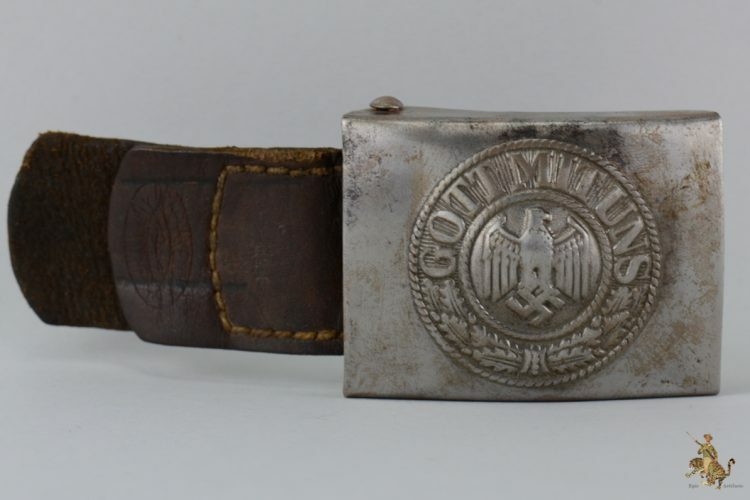 This is a very nice, early, and named Artillery Waffenrock belonging to an NCO. This Waffenrock is a time capsule, and is sill in an unaltered state since the war. 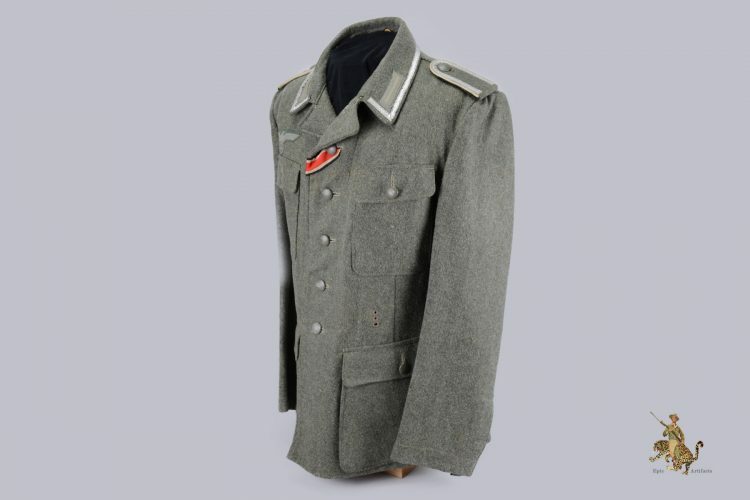 This will beautiful addition to any collection.